I believe that you should not walk on the escalators at all. You should board them in pairs to maximize throughput, resulting in shorter travel times for all participants. But I am in a hurry! Once no rushing is possible, you will include escalators in your travel time estimates just as you do with the time spent riding the train. Since on average the throughput will be larger, you will get to your destination quickly, even when not rushing. At my home subway station, less than 10% of the people reserve 50% of the total capacity for 100% speed boost. The remaining 90% of the people are getting significantly delayed, leading to a congestion at the bottom of the escalators. You need to stop this madness now! Huh? Wouldn't walking on the escalator get you there faster? Maybe you should do what everyone else in the world does? Stand to the right, walk to the left. I think you need to re-think your statement here. Everyone walking would maximize throughput resulting in shorter travel times, not everyone standing still. That would actually result in shorter travel times for all participants, unlike your proposal (which would lengthen the transit time for people who care enough to walk currently). The remaining 90% of the people are getting significantly delayed, leading to a congestion at the bottom of the escalators. Almost by definition, those 90% (or at least the probably 95% of them who are physically capable of walking up) are choosing to be "significantly delayed." They care more about being lazy than they do about getting to their destination quicker... so why do you care about shortening their travel time? Izawwlgood wrote: Huh? Wouldn't walking on the escalator get you there faster? When you rush to the top, I need to wait for 9 instead of 4 people to get on the escalator before me, should I decide not to walk. Yes, I might want to walk, but we have these really long escalators and you can't stop walking once you are in that lane so I frequently end up in the slow lane that is that much slower because of those rushing. Because our of 90 such people there are 5 who will introduce choke points because they are elderly, small children or have otherwise limited mobility. You can't eliminate the non-walkers, but you can stop the walkers. Plus the escalators have not been designed for comfortable climbing, the steps are too high. Izawwlgood wrote: Maybe you should do what everyone else in the world does? Stand to the right, walk to the left. No, I don't always feel fresh enough to walk up such a long flight of high stairs. I wouldn't mind risking to miss the train, though. Most people can tolerate delay (apparently). But I would like the aggregate benefit of less time spent commuting. Plus it would save thousands of man-hours every day (just here) if people only stood still. Smoother travel is also more enjoyable, even when slightly slower. Also, in congested cities it's normal for drivers to utilize all lanes in order to gain higher throughput. Why don't pedestrians do the same? So, you'll tolerate a delay due to not walking up yourself, but not tolerate a delay due to reduced throughput due to those in a rush? If throughput is to be maximized and delays minimized, have everyone walk up, and let those who cannot (or don't want to) use the elevator that's invariably also present for specifically that purpose. I don't understand your response. If you are too tired to walk up stairs (get in shape man), stand to the right. That way you don't slow down people who are in a hurry and walking on the escalator. People who, walking to the left, have absolutely zero impact on how smooth your travel is. Mordae wrote: Also, in congested cities it's normal for drivers to utilize all lanes in order to gain higher throughput. Why don't pedestrians do the same? You'll also notice in highway driving that the left tends to be the passing lane, while the right tends to be the 'driving with traffic' lane. When traffic is highly congested, this breaks down, but then, in a very crowded environment, no amount of organization like this is going to matter anyway. Mokele wrote: So, you'll tolerate a delay due to not walking up yourself, but not tolerate a delay due to reduced throughput due to those in a rush? Yes. I would be very glad when I would be awarded the benefit of going up much faster with no extra effort exchanged for the impossibility to gain less than 1 minute gain in times of need. I cannot make the train, BUS or tram go faster anyway and I can cope with that. And aggregated, there is a lot of time saved for everyone. Mokele wrote: If throughput is to be maximized and delays minimized, have everyone walk up, and let those who cannot (or don't want to) use the elevator that's invariably also present for specifically that purpose. Peculiar. These are not present at every station and only rarely are appear on both ends. Also, the speedup will be much smaller than you expect since near the top the people would slow down significantly, pushing back at those at the bottom. Long stairs, steps not designed for walking, remember? So, is the mass of polite, quiet standers supposed to accommodate for walkers' inability to maintain proper schedule? But how do you accommodate people walking down the escalator? Also, maybe it is just where I live, but I've never seen an escalator so congested that there wasn't ample room on it any any given time. Here in Boston, the Porter train station has a SUPER long elevator. During peak hours, the station gets quite crowded. However, people never seem to clog the escalator. In Chicago, O'hare has the moving walkway to connect some terminals, and again, even during peak travel times, it gets crowded, but people never seem to clog it. I'm genuinely confused why the OP doesn't seem to understand 'stand to the right, walk to the left'. Izawwlgood wrote: I don't understand your response. If you are too tired to walk up stairs (get in shape man), stand to the right. On days when one comes home so tired that he can't even walk up 100 high stairs without breaking a sweat, must he still suffer the unbearable queue at the bottom of the escalators, waiting almost a minute to get on? Just because some people have had an easier day? That's not smooth. That's not soothing feeling of getting near your bed. That's just agony. And why can't you do just the same during the peak hours? Why demand that people either walk or stick on one side, inflating the huddle at the base? Izawwlgood wrote: I'm genuinely confused why the OP doesn't seem to understand 'stand to the right, walk to the left'. I understand that custom, but I fail to see it's purpose during peaks. It's effect are 40%+ empty escalators with throngs of people at their bases. Utilizing both lanes would disperse the crowds much more quickly and people could just walk, stand while moving at the walking pace and the walk again with no interruption. Instead they are standing queues for standing or pushing through the crowd just to get on the fast lane. No; allowing people to walk on the left should mean FEWER people waiting for an escalator, not more. It also isn't changing the number of people you can fit on an escalator, it's simply reducing the amount of time someone spends on it. Thus, if you want to maximize the escalators efficiency, as measured by 'time spent moving people from the bottom of the escalator to the top', you should encourage people to walk. Izawwlgood wrote: No; allowing people to walk on the left should mean FEWER people waiting for an escalator, not more. Sadly, you are mistaken. The average utilization of the fast lane is 25% in the USA, approximately 10% here in Czech Republic (maybe even less) and 3% in Shanghai. But it stays reserved all the time because people are afraid not to leave it. They might get disturbed by any potential walkers if they don't. Sometimes I can see all the way down from the 1:45 escalator with one side completely filled with people and the other side completely empty. The escalator police aren't patrolling these things. Just utilize the whole escalator, and if someone is walking, they will walk on the left. They can even politely ask you to step aside if you insist on standing to the left, and no one has to be worse off for the interaction! Why, if you're alone, they might even pass you on the right! I'm still totally uncertain what your beef with this whole thing is. If you want to stand, do so, but be prepared to make way for people who don't want to wait behind you. This is all pretty basic etiquette. The problem might be more of people wanting to avoid standing too close to one another if they can avoid it. There is nothing to stop a person riding side-by-side with someone else. If a walker comes up behind then maybe there is a social "Excuse me. I need to get by." Kind of situation, and depending on the personality of the people involved it could get heated, but there is no "right of way" system for escalators other than just a public norm that forms a kind of tradition. The call shouldn't be for all walkers to stop walking, but for all standers to stop standing in a single line when they don't obviously need to. If it is crowded, people should just naturally stand side by side to accommodate more people, and walkers should walk when and as they can. Otherwise follow the "stand on one side, walk on the other" rule. Ideally, everyone should telecommute anyway. that sounds like pretty amazing discipline. in my experience, the rules start to break down when the escalator gets near capacity. statistics demand it, because one obnoxious standing person on the left halts the whole column. failing that, even the usual traffic jam mechanics guarantee people standing still on both sides. Whizbang wrote: The call shouldn't be for all walkers to stop walking, but for all standers to stop standing in a single line when they don't obviously need to. If it is crowded, people should just naturally stand side by side to accommodate more people, and walkers should walk when and as they can. Otherwise follow the "stand on one side, walk on the other" rule. When nearing full capacity, the people down are getting impatient, thus increasing their potential to turn into walkers. (Have I actually said that?) In that situation the first person who uses the fast lane for standing gets "could you, please"d to death. But this is exactly the situation when the escalator should be filled as much as possible for a while. The people just don't want to be perceived as impolite, but keeping the fast lane open and thus delaying everybody else is considered acceptable. But, again, walking on the escalator doesn't reduce the escalators capacity, and walking on the escalator and saying "Excuse me" to a handful of people who are blocking the whole things isn't the end of the world. And in anycase, most escalators I've seen are wide enough for two people, but most people don't stand shoulder to shoulder with a stranger. People standing the case of wide escalators are typically doing so one person per step, and leaving an extra step in front of them or behind them to keep distance from strangers. Which, again, means that there's an open lane to their side. Again, I don't think you're being reasonable with your assumptions here, and I don't think you've really made yourself aware of the typical etiquette of an escalator. Indeed. If he were concerned about throughput, then shouldn't his demand be "Everyone MUST walk on escalators" ?? I don't see a big effect on throughput either way - if walking takes up twice the space but finishes in half the time, it has no effect. It'd be smoother and more convenient if everyone could agree to one thing. My preference would be for walking, but I wouldn't complain about the inconsiderate lazy buggers who stand in my way. You don't have to complain. You can literally just tap them on the shoulder and say 'Excuse me!' and politely and calmly walk on by. Seriously, do you guys live in a world where interacting with strangers is punishable by death or something? Also, in what possible way do walkers take up more space? People will still arrange themselves in maximal social comfort, which on escalators seems to be about 1 or 2 steps apart. People do not tend to stand shoulder to shoulder with strangers anyway, so this notion of standers being more compact is kind of strange to me. Whoa, whoa... you're waiting almost a minute? That's damn near 60 seconds! In all seriousness, aside from the fact that you're whining about the "agony" of being held up for less than a minute; your entire premise is wrong. As others have already pointed out multiple times, allowing people to walk actually speeds up the process. The queue that you're seeing at the bottom would be longer if people were forced to stand still, because people would be spending more time on the escalator. You might find yourself waiting for an entire minute or more. If people stand on the right and walk on the left, that means at least half the escalator is being used more quickly; which in turn means that more people are getting through in the same amount of time. Well that depends completely on the walker:stander ratio. If walkers walk as fast as the escalator* then half as many walkers need to be on as standers to get the same flow rate as all standers, any fewer walkers and the flow rate drops below the all standers rate. The walker:stander ratios In my (limited) experience are more like 1:4 max so only 75% of all standing flow rate. Even if the walker:stander ratio gets better it's limited by space; it's quite possible for standers to be on adjacent steps but walking one step behind someone is pretty hard, trying to get 10 walkers to simultaneously synchronize their steps isn't going to happen. But, either way who cares, I sometimes walk sometimes stand, having both options is nice. I think getting pedestrians to consistently walk to one side of paths is a more pressing issue. It helps a lot when driving, why not carry it through to walking? Or do people enjoy the sidewalk shuffle? Another pet peeve of mine is people trying to enter a lift as soon as the door opens, FFS stand back, someone may need to exit first. *I think this is an over estimation, ever tried walking up a downward escalator? I think it's faster than the average walker speed. Mordae wrote: I believe that you should not walk on the escalators at all. You should board them in pairs to maximize throughput, resulting in shorter travel times for all participants. I think boarding them in pairs and walking would make throughput even higher than your half-baked idea of standing still on the fun-stairs. I hope no-one tries Mordae's ideas on the London Underground. They'd get shot. But that defeats the purpose of escalators doesn't it? Izawwlgood wrote: Also, in what possible way do walkers take up more space? People will still arrange themselves in maximal social comfort, which on escalators seems to be about 1 or 2 steps apart. People do not tend to stand shoulder to shoulder with strangers anyway, so this notion of standers being more compact is kind of strange to me. I have very rarely traveled to other countries, but this is the biggest difference when I travel. America has a rather large "person bubble". In the Philippines, I was standing so far away from other people, that almost everyone assumed that I was out of line or something. I had to get used to the much closer quarters. So just keep that in mind, the social norms really do make a big difference in how people stand close to each other. Ok, fair enough. "People will stand as close as socially normal for their location". There's probably much greater range of social comfort for proximity than there is range of step size or width in escalators. And standing is still just going to slow the process of moving people along the escalator. It is much easier to stand close behind someone than walk close behind them. If everyone on an escalator was standing there would be more people on than if they were all walking. People need more room when they are walking. billy joule wrote: it's quite possible for standers to be on adjacent steps but walking one step behind someone is pretty hard, trying to get 10 walkers to simultaneously synchronize their steps isn't going to happen. I actually tried walking as close as I would stand the other day, it's takes a fair amount of concentration to keep up without stepping on heels. And it's much creepier following that close than standing at the same distance. billy joule wrote: But that defeats the purpose of escalators doesn't it? 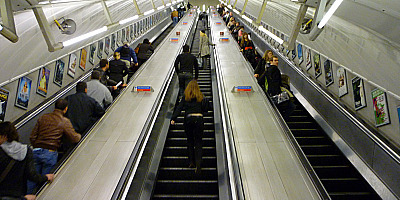 The purpose of escalators is to transfer vertical momentum into humans, to reduce the energy they must expend in order to travel a set distance upward at a variable velocity and time. If you want to carry yourself up, you can use the normal stairs. If you want to be carried, that's what elevators are for. In most civilized countries, you won't find a lot of escalators without accompanying elevators, because building owners realise that it's difficult to get on an escalator with a wheelchair. So if you want to stand still shoulder-to-shoulder with a stranger for a set amount of time, you don't need the escalator for that. If you're in a hurry, the fastest way would be to grab someone's arm and walk up the escalator in a pair. * If you're not interested in optimizing, just obey the norm. *Running would not be safe, I think. I think "alive" would be a Boolean parameter best kept at "True" for the purposes of this optimization. You may disagree. I'm open to suggestion on this point. Sadly, you are mistaken. The average utilization of the fast lane is 25% in the USA, approximately 10% here in Czech Republic (maybe even less) and 3% in Shanghai. Then in the USA, you have to change the behavior of 25% of the population either way. Just convince one-third of standers to walk instead and you get the ideal 50/50 split, resulting in less wasted space *and* higher throughput especially for people in a hurry. You guys suggesting simply tapping people on the shoulder to walk in the "fast lane" if there's someone in the way, have clearly never used the London Underground during peak times. You are safer walking up to people and calling their mom fat than you are standing in the walking lane. It is just Not Done. Also: all of you guys that advocate for walking (not that I'm advocating for not walking, just observing) are neglecting the uncomfortably high step size on escalators, which would indicate that they are not intended for climbing and makes it far less energy efficient to do so than climbing normal stairs or standing still on escalators. I personally prefer to stand still and do wonder what people do with that spare 0.73 seconds they've shaved off their travel time (impending train departure not withstanding), but hey if you want to climb up a device that was specificially designed so you don't have to climb up, I'm not going to try and stop you. Huh... maybe American Escalators are just wider and designed for walking. It really isn't uncomfortable at all to walk on escalators in this country. Neither are at their peak hours, clearly. In either case, it doesn't look that bad to walk on Londay Subway Escalators. Maybe its just how the picture was taken, but I do think the London Subway escalator looks a bit thinner, but I don't think its much "taller" than the American escalator. Moo wrote: Also: all of you guys that advocate for walking (not that I'm advocating for not walking, just observing) are neglecting the uncomfortably high step size on escalators, which would indicate that they are not intended for climbing and makes it far less energy efficient to do so than climbing normal stairs or standing still on escalators. Huh, a bit of googling says that the average height for stairs is ~7.5 inches, while the average height of escalator steps is ~8.5 inches. Even if they're a tad taller than normal stairs, they're certainly not prohibitively so. But, again, no one is saying you can't stand on n escalator. We're just saying stand to one side, so people who don't want to be held behind you can walk, and, that walking expedites the process of taking the escalator. Moo wrote: I personally prefer to stand still and do wonder what people do with that spare 0.73 seconds they've shaved off their travel time (impending train departure not withstanding), but hey if you want to climb up a device that was specificially designed so you don't have to climb up, I'm not going to try and stop you. I'd say you shave way more than that, and hey, maybe the device was designed to get me from across the span quickly, not just effortlessly. At airports, I don't view moving walkways as a 'break from walking', I view them as booster strips to get me to my destination faster. That is an interestingly small difference in height; I expected more. For me personally it is the difference between "eh, I'll take the stairs, the exercise will do me good" and "jeez these stairs are too far apart, climbing them is actually really uncomfortable". Yeah, I suspect it's more on the order of that much shaved off for every step. I think others are on-target with their guesstimates that walking up roughly doubles your speed, so especially long escalators can have loads of time "shaved" off. Even if it's not the difference between getting on a bus and missing it, if you're close to running late as it is it can have a huge psychological benefit to walk continuously instead of standing there like a lump. I was being overly dramatic, that wasn't meant as an actual estimate.